The Arch of Titus was painted by Vanvitelli on several other occasions: five are on canvas, one on copper, and one is a tempera. 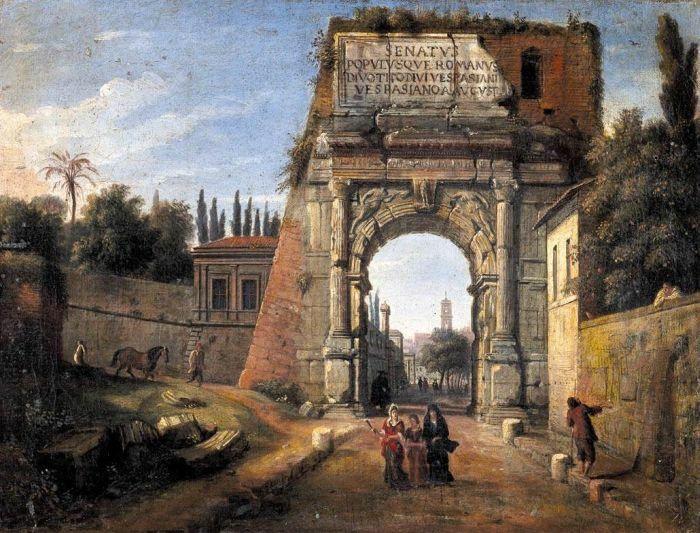 The Arch was frequently painted by vedutisti throughout the 18th century, and many chose to portray it from this side because of the bas-relief's better state of preservation. SPECIAL NOTE : The painter will make the reproduction as close to the original oil painting as possible. If you want your painting to alter from this likeness, please email us and " Rome: View of the Arch of Titus, 1710 " will be reproduced according to your special requirements.